13 knots, flat water, sun, blue skies and the stunning backdrop of the mount Esterel overlooking the Bay of Cannes. Who could ask for more on the opening day of the 40th Régates Royales – Trophée Panerai, after two days of waiting for the right conditions? All sails up, the armada of 200 classics, Dragons and 5,50 offered a display of beauty and elegance and racing was as close as it could be. “Spinnaker down!” At the downwind mark rounding, the crew of Moonbeam of Fife lowers the huge sail decorated with a black dragon. There are five men working to take in the sail while five others are trimming the mainsail sheet, as the boat accelerates upwind. What a show! Hallowe’en, the Marconi cutter nearly 25 metres long, is less than one boat length behind. The two yachts, designed by famous architect William Fife, are duelling as if they were having an America’s Cup match-race. This is close racing “classic style” at the Régates Royales. 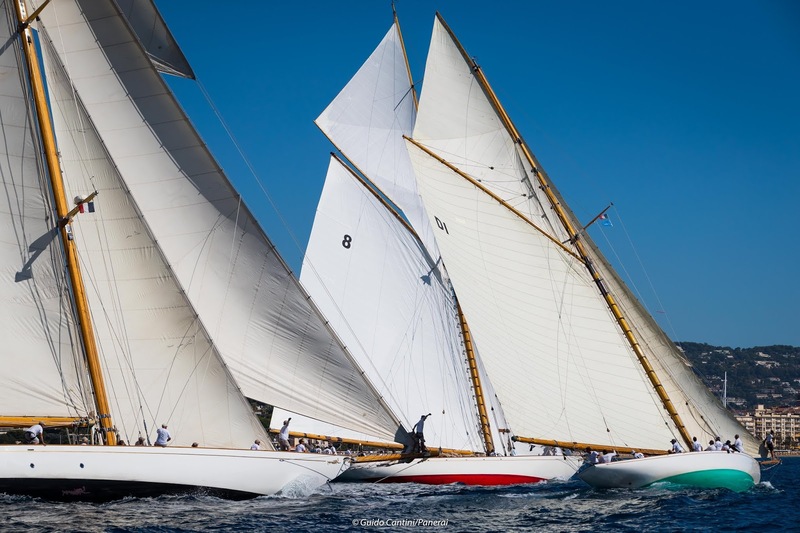 Good manoeuvres, sails perfectly trimmed, right tactical calls: racing in the Bay of Cannes does not leave any room for mistakes. In the Big Boats division, Moonbeam of Fife is leading the provisional ranking, having managed to keep at bay serious contenders like Mariska and Hallowe’en. Perfectly at ease in today’s medium wind conditions, the gaff cutter Kelpie (1903) leads on Kismet and Viola while among the huge schooners, with their immense sail plan of over 1,000 square metre, Elena sits in first ahead of Mariette. In the other group early leaders are Sagittarius (Classic Racer), Yanira (Classic), Cippino (Marconi de plus de 15 m), Fjord III (Marconi de moins de 15 m) and Vanessa (Spirit of Tradition). Three races today for the 50-boat strong Dragon fleet and a three-way battle has already opened up, with Blue Haze skippered by UK’s Ivan Bradbury, Anatoly Longinov’s Russian-flagged Annapurna and Germany’s NN helmed by Nicola Friesen occupy the provisional podium spots, divided only by 4 points after four races with one discard. Tomorrow, the weather conditions should remain ideal with some 10/13 knots of wind and another sunny, warm day.